1. You need to chase something you can actually catch. God gifted you and placed you. There are certain things you just aren’t going to be called to do. Don’t get me wrong, God can certainly add to you what He needs you to have, but consider who He’s made you when you dream. Is what you’re dreaming something that He’s told you to do or something that you just wanna do. If it’s an “us” dream, we’ll never catch it… we’ll be like the stupid dog chasing the car. If it’s a “God” dream, He’ll help us get there. Hear Him. Trust Him. 2. You need to pace yourself. That dog always comes up short and walks back out of breath. As a leader, we have to pace ourselves. 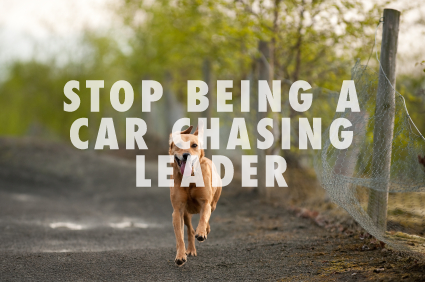 I’ve seen too many times leaders that start out with good and Godly goals, but chase too hard and too alone and run out of wind. Pace yourself. Be sure to fill up along the way.